The extra day in camp is spend on a seldom visited (except by our guests) wild river with Trapper Rick. This involves an hour boat ride, traveling over old logging roads by truck, crossing the river by boat, hiking to Rick’s cabin, fishing in the river if interested, a picnic lunch, watching salmon in a fish ladder, enjoying amazing scenery, watching salmon leap the falls below the cabin, and on most days watching grizzlies catching salmon. 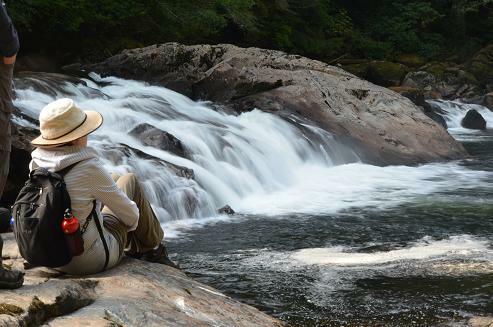 Not to forget conversations with Rick who has lived with the grizzlies for more than twenty years on this river. Once these first year grizzly bear cubs do catch a salmon they need to eat it on the riverbank. The pool they are fishing has many salmon that died of the heat this summer. The water level in the river and spawning channel was very low and the temperature high. This meant the oxygen level in the water was too low for the salmon and several thousand died. 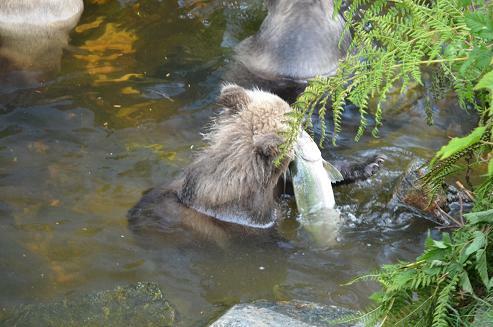 Bad for the salmon but good for the bears as they were able to pick up salmon from the bottom and take them to shore. The only problem for this cubs was that it’s sibling was in front and not moving out of the way. 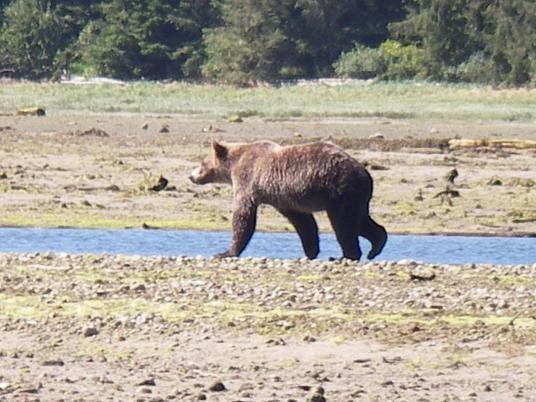 Prior to August 25th grizzly bears tours are in the Glendale River and its estuary. We use a flat bottom skiff to move up river with the incoming tide. Frequently the first sighting of grizzly bears is from a distance, which requires a telephoto lens for good pictures. 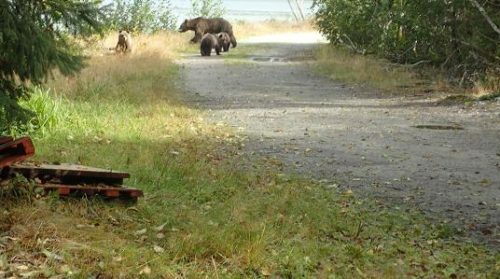 Today’s posting is an example of that first sighting of four grizzlies which became close-up photos once the tide rose a little more. The first view of a grizzly is the most exciting and from talking with guests over the years it is often more memorable than the closer encounters. For the closer encounter just scroll through the previous postings. 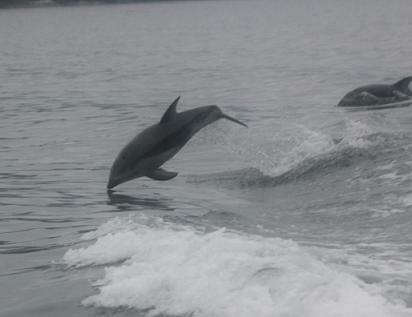 Pacific whitesided dolphin love to play in the wake of the boat or to ride the bow wave. The most reliable way to obtain photos when you are traveling with a pod of several hundred is to point and click as many times as possible. Once you return to the lodge you can delete all the pictures of sky and water and you may have one or two keepers. The best way to enjoy the dolphins is to put down your camera and buy one of the photos that Glen, one of the guides, has for sale. This running with the dolphins can happen on any of the day trips whether to view grizzly bears, whales or a visit to the wild river on the extra day in camp. If you have time to refer to the posting of June 16th this is again the resident killer whale pod A30 with A72 the last orca with a notch in her dorsal fin. The guest in the corner of the photo provides a little perspective for the closeness of the orca. 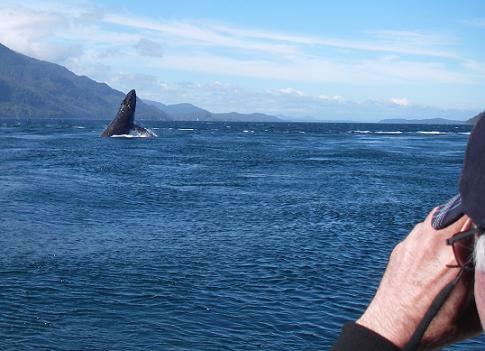 On the lodges whale watching safaris we are on the water 7 to 8 hours which allows us time to position ourselves for a number of good pictures of the wildlife we view. 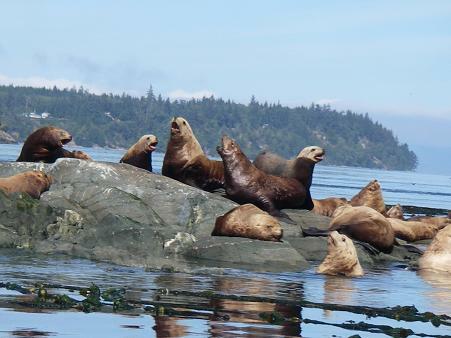 The whale watching tours view marine wildlife such as killer whales, humpback whales, dolphins, porpoise, harbour seals, Steller sealions, occasionally minke whales, a wide variety of waterfowl, bald eagles, and frequently black bear as we travel to and from the lodge. The lodge uses a viewing platform on the Glendale River after August 24th. The platform is located so two sides are the natural river and the third is the entrance to a man-made spawning channel. This third side has deeper water than the river and requires the grizzlies to dive to pick up the dead salmon that have drifted down from the shallower water. This is by far the easiest way to fish for little energy is used for the calories gained. 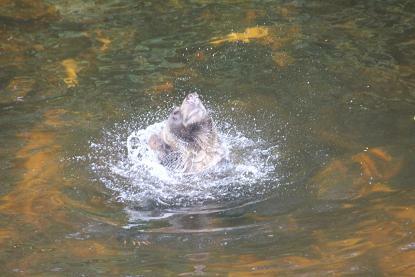 This type of headshake occurs frequently and is likely to clear the water form the ears. Are you are wondering about the forth side to the stands? That would be the walkway to get to the stands. 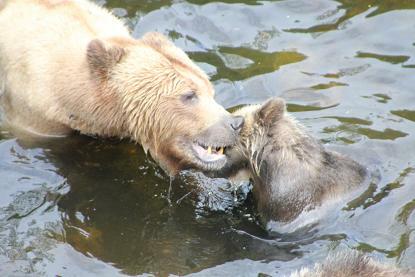 This may appear to be a nuzzle or “kiss” from a mother to a cub but it was more of a discipline growl. At the edge of the photo is the cub that got the message and was moving away but the other stayed. The message was if you want food you need to get out of the way and let me fish. The one cub being disciplined was more interested in playing but playtime was over. It seems that Steller sealions get little rest. They may be at one of their haul-out areas but seldom is all quite. As they come and go from the water they climb over each other and just as they get settled again another one moves to start the roaring all over. On occasion we may eat lunch in the area of the sealions but only if we are up wind. The noise is bad enough but the smell is worse. This is the third grizzly from the posting of June 18th. It came down the bank of the river not far from our boat and had absolutely no interest in what we were doing. It was about 15 meters (yards) away and as far as it’s interest it could have been a kilometer (mile) away. It passed by and went to the edge of the water and stared out into the bay for about five minutes. Seemed to lose interest and returned to be with the other grizzlies. All I can think of is that there were two yachts anchored in the bay and maybe it smelled food. The amazing aspect of this breaching was the location and number of breaches. We were on a whale watching safari at Cracroft point with a pod of resident killer whales that were feeding on the salmon feeding on the herring in the fast water of the tide ripe. The humpback was in the same area feeding on the herring when it started to do this lunging and coming down with a load slap. This occurred in an arc on the outside of the killer whales. The arc was over 200 meters (yards) long and the lunging was repeated eleven times in a row. It did not seem to bother the orca so it happened a second time but only eight lunges. The orca kept feeding and the humpback returned to it’s herring and the guest got a great show and pictures. ..fast forward to 9/2/2015 12:32 pm and our viewing is over and we have driven back to the landing to take our skiff back to the float to eat lunch. We had just parked our vehicle and were getting out to walk down the road when we had company. Back into the vehicle until Bella and her three cubs moved across the road and far enough along the beach until it was safe to complete our trip to the float. This took about fifteen minutes but the guests did not seem to mind. They thought it was interesting that we were delayed by grizzlies when we wanted to watch bears and again when we were through watching bears.